Gloria Matthews passed away on March 19,2019 at the age of 81. Her life began in the small town of Hood River, Oregon where she was raised with a large extended family who encouraged her early interest and talent in music. 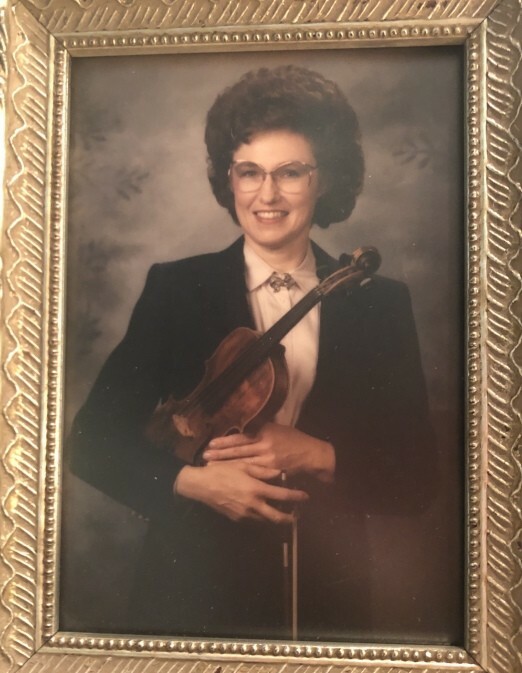 Violin was her first instrument of choice and life long passion. By the time she was a teenager she was regularly performing with professional musicians from the Portland Symphony Orchestra. Her talents didn’t stop there, however, she also became an accomplished pianist and organist. She earned a BS in Nursing from Walla Walla University and worked as a public health nurse in rural Oregon until she married and moved to California with her husband Tom Matthews. They eventually settled in Lindsay where Mrs. Matthews became a fixture in the music community of Tulare County. She was a long time member of the Sequoia Symphony Orchestra. She also performed at various churches and community events in Lindsay, Visalia and Porterville, including as the organist at Lindsay First Presbyterian. In the later part of her career she became a Music teacher first at Sierra View Jr. Academy in Exeter and later worked in the music program in Lindsay Unified School District. She is survived by her husband of 58 years, three daughters, four grandchildren and her sister and brother. Memorial Services are planned at Lindsay Presbyterian Church, 351 E. Hermosa Ave., Lindsay on Friday, March 22 at 11:00 AM. In lieu of flowers, the family would appreciate donations to The Sequoia Symphony Orchestra. Internment will be private. Webb Sanders & Smith Funeral Home is in charge of funeral arrangements.